The woman was buying the carcass of the armadillo, probably for a nice Sunday meal, when negotiations seem to have broken down. The man she was buying it from allegedly threw the armadillo at her. Now, I am not one to condone violence against women, but I think report’s focus is all wrong. Even now I can see you reading the report and thinking “poor woman” or “what a terrible man.” I can bet my left eyeball that no one cares about the armadillo. Why should you? It’s just an armadillo and a dead one at that, right? Wrong ! It’s not just an armadillo. Think of it as someone’s son, someone’s brother or someone’s husband. And see how the picture changes. I mean is it not enough that the poor chap is dead (frozen at that) and people are salivating at the prospects of getting on the outside of its body? Is it fair that it should be used as an assault weapon? Did it ask for it? I am sorry, no. Outrageous. I am stunned that there is no blanket ban on the use of dead armadillos as assault weapons. I mean, if I were an armadillo and had just kicked the bucket, I would then just have to worry about the cooking pot. And not have to concern myself with being flung about at folks! 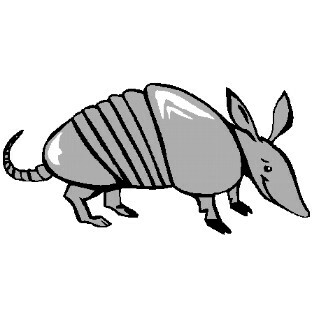 I hope the reporter Evann Gastaldo ( @egastaldo on Twitter) is more sensitive to rights of armadillos (dead or alive) in the unlikely event that she has to write about an armadillo assault in the future. Have you ever wanted to find out your exact tolerance level for alcohol? I mean we keep hearing about people having had “one too many drinks!” I think, and I am sure you will agree with me here (unless of course you have had one too many yourself) the real key is knowing when to stop. Well, I am happy to tell you that I think we have finally a sure-fire test to figure this out. It is called the River or Parking lot Test. Sit in front of the river. Look carefully at the river. Note down what you see in the notebook. If what you have written reads “river” then have a drink. Repeat. If at any time during the above mentioned steps you see the words “underground parking lot” appear on the notepad, promptly stop guzzling the nectar. Now, I can see that you are scoffing at this novel theory of mine. 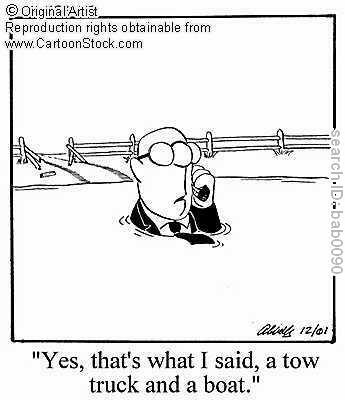 Well, if you do not pay heed to it, you might end up with your car in the river and your driving licence with the police. That’s exactly what happened to Peter Thaler. This Swiss man obviously had had “many too many” and mistook a river for an underground car park. Having happily parked his car (no doubt bucked at having been able to park it in the exact right spot even while intoxicated) he went away humming to himself. “He was confused because of the fog – but mostly because of the drink,” the report quoted a source as saying. Little did Thaler know that the police were just waiting to nab him when he went to collect his car. The police took away his licence and fined him and (beat this) asked him to pay costs for the recovery of his car. I personally think that the authorities exhibited a marked lack of a S of H. But then, in their defence, the police say that he was so massively drunk that he flunked a breathalyser test on the day after the parking-car-in-the-river incident. Depressing, or what? Enough to make you take to the bottle, yourself.